This site is dedicated to all who served aboard the USS Kretchmer, 1943 - 1973. The USS Kretchmer Reunion Group was formed in 1988 when WWII Kretchmer crewman Dwane "Red" Robinson and his wife Rosie took the initiative, did the work and held the first reunion in their hometown of Emporia, Kansas. We have held a reunion every year since. We are proud to have on board crew members from the years 1943 through 1973. 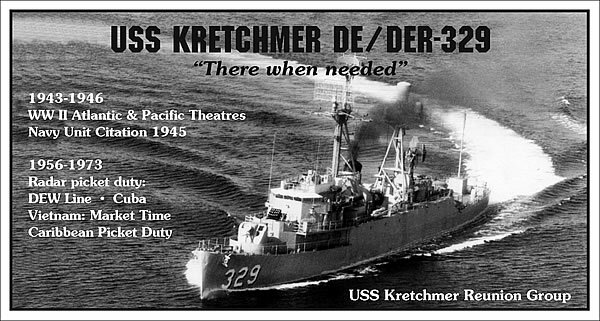 This site is here for anyone with ties to the USS Kretchmer DE/DER329 to find old shipmates, to communicate with and share stories and photos and to get updates on mates, first mates and family. Our ultimate goal is to get you to attend a reunion! A very big CONGRATULATIONS and THANK YOU to Joe and Carolyn Peirce for hosting a very successful and fun-filled reunion in Gulfport, MS this past September. Over 100 Kretchmer Family members had a great time. The 2019 (32nd annual) Kretchmer reunion will be held in DAYTON, OHIO. We will gather at the "Crown Plaza Hotel" downtown Dayton from Sept. 11-15. See more on the REUNION tab. We urge you to become a member and become a part of the Kretchmer "Family". To become a member, click on the Sign In Page.